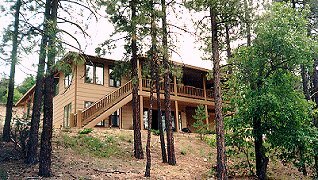 Situated on two secluded ponderosa covered acres in historic Williams, Gateway to the Grand Canyon. Golf, galleries, antiquing, fishing within minutes. Hiking begins at our door. Eleven elegant rooms and suites with luxurious private baths. All rooms have TV's with HBO, Video tape players and CD stereos. Access to our library of tapes, C.D.s and literature. Spa, fitness room. Full gourmet breakfast in intimate dining room or on deck among pine boughs. This and other Grand Canyon Bed and Breakfast Inns can be found here in The Register. Romantic Country Inns, Getaways and B&Bs offer a great Williams lodging alternative to big hotels.